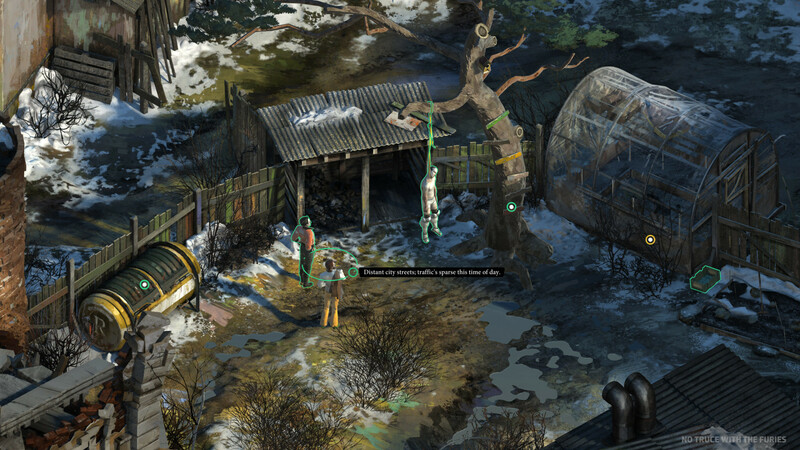 As I got ready to play Disco Elysium (formerly No Truce with the Furies) I was chatting with ZA/UM Studio’s community manager and she described it to me as True Detective meets Baldur’s Gate – a pretty good combination if you ask me. I’d already marked the game as one I really wanted to try out and this just made me more excited to play it. I got hands on for about 30 minutes and it was some of the most interesting, engaging and funny opening 30 minutes to a game I’ve played in a long time. 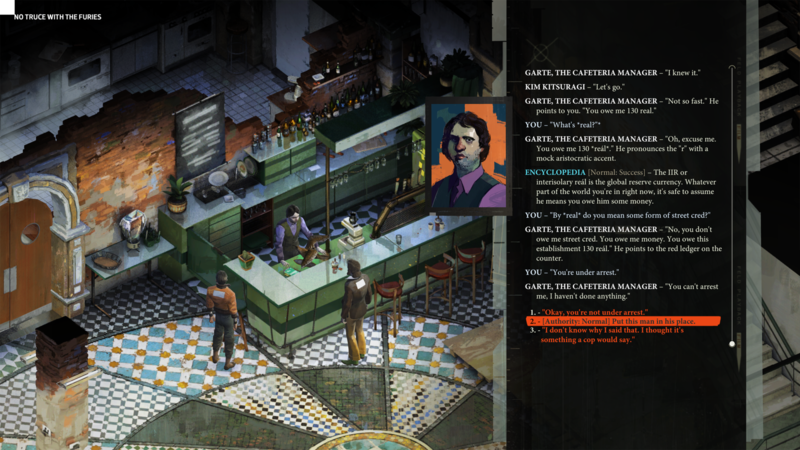 Disco Elysium is billed as a blend of isometric RPG and hardboiled cop show. Solve a massive, open ended case in a unique urban fantasy setting. Kick in doors, interrogate suspects, or just get lost exploring the gorgeously rendered city of Revachol and unravelling its mysteries. Tough choices need to be made. What kind of cop you are — is up to you. We’ve all played those RPG’s that have some kind of quest that revolves around solving a murder or a crime of some sort and they’re usually pretty good and in some cases some of the best kind of side quests. Well Disco Elysium is kind of that all the way through, and the early signs really do point to you being your own kind of cop able to forge your own paths down crazy rabbit holes of conversation. At the start of the demo everything is pitch black and you’re having an internal monologue/battle with a part of you mind, debating whether to wake up or just die, you get to interact with this primordial lizard side of your brain and it’s crazy, weird and wonderful – a strong opening I’d say. Eventually you wake up in a hotel room with a mega hangover, it’s tough to remember details of what previously happened, not just the night before, but anytime, and that was kind of how I played every encounter during my time – oblivious to almost anything, which I think made things infinitely more fun. Disco Elysium has a very interesting approach with dialogue; you can talk to yourself, or more specifically different parts of your psyche. They will also surface during other conversations you’re having, either giving you additional options for speech i.e. skill checks, or just interrupting you with some opinion on the matter. Each part has a different personality and lets you to act in certain ways; they also link to your characters stats – not something that I really got to look at in the demo. In a way your character acts a bit like a filter for these personalities within you, stopping you from blurting out the terrible things you’re thinking or wanting to say, but it seems like you can also just blurt it all out in you fancy it. Within minutes of the demo I was accusing the bartender of committing murder even though I had absolutely no evidence – I was only just remembering that I was a detective investigating a murder…I was persistent with my accusations based on nothing, until the point where my partner had to step in and stop me. Some of the dialogue choices were hilarious and had both me and Murr laughing quite a lot. You can see in the image below how the conversations can escalate, it’s good! Disco Elysium felt fresh, exciting and not like anything I’d played before, both in the way talking and interacting with people played out and the visual style of the game. Some of the voice acting sounded amazing too, I forgot which part of ‘my mind’ it was, but it had a very thick and deep croaky cockney accent that sounded really menacing – it was excellent. In general the voice acting throughout seemed great and really helped you feel immersed right away.